Angina Pectoris is characterized by episodic ischemic cardiac pain of variable intensity. 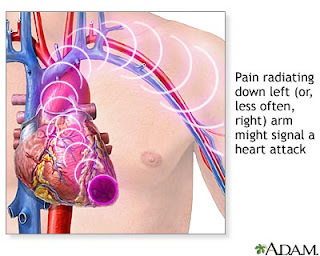 The pain may be limited to the chest but most of the times it radiates to the left arm and sometimes to the lower jaw and back. Angina is the pain of limited duration approximately 15 minutes and relieved by taking rest or sub-lingual nitroglycerine treatment. Coronary vasospasm (spastic contraction of a coronary artery), Stenosing ( of narrow lumen ) coronary artery or platelet aggregation (may block the coronary artery), all these three conditions affect the blood supply of the heart. During exercise or exertion, myocardial demand (demand of heart muscles) of blood increases. But due to the above-mentioned conditions, blood supply to heart can't meet the increased requirements. Lack of blood supply is called ischemia, therefore angina pectoris is referred to as ischemic pain (pain caused by lack of blood supply to heart muscles). In this type, pain occurs when myocardial demand increases ( for example, during exercise or exertion) and pain fades quickly on taking rest. In most of the cases, it is associated with atherosclerosis. It occurs due to coronary artery vasospasm (contraction of smooth muscles). The mechanism that causes such intense vasospasm, as to cause a clinically significant narrowing of the coronary arteries is, as of yet, unknown. It is hypothesized, however, to be related to dysfunction of the endothelium of the coronary arteries. This type of angina Pectoris responds to calcium channel blockers or nitroglycerine. It may occur even at rest. It is of longer duration and is of lesser intensity. The patient may feel pain or chest squeezing sensation and heaviness or arms. During an attack, there will be flattening or depression of ST segment and Inversion of T waves. ECG is found to be normal between the attacks. The patient is asked to run on a trade mill for 5 to 10 minutes and then ECG is taken to see any abnormality. It helps to find out any obstruction in the coronary arteries. It is a technique used to recognize ischemic areas or heart wall.